Red, orange, yellow, green, blue, purple, black, and white all shoot out from what appears to be an epicenter of activity in the top right corner. A larger white, wing-shaped form floats to the left, filling the left half of the composition. The rest of the painting has been left unpainted. 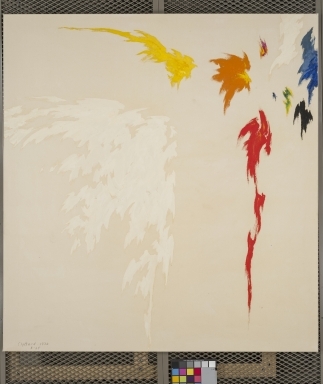 Clyfford Still, PH-712, 1970. Oil on canvas, 83 3/4 x 78 1/8 inches (212.9 x 198.4 cm). Clyfford Still Museum, Denver, CO.